We’ve known for years that British Columbia’s Northern Spotted Owl, known to the pointy-headed science crowd as Strix occidentalis, is in trouble. Provincial wildlife officials estimate that as few as 10 of the birds remain in B.C.’s forestlands, down from about 500 individuals a century ago. The owl’s dire plight led the province to establish a captive-breeding program in Langley in 2007. The program has seen limited success to date. The biggest threat to the owl’s existence is habitat loss. A century of logging has decimated the old-growth forests the owls depend on. However, beginning a few decades ago, another threat to the reclusive, dark-eyed owl appeared. Barred Owls, also known as Eight Hooters, Rain Owls, and Strix varia, arrived west of the Rockies in the 1940s. Aggressive and adaptable, the newcomers compete with Spotted Owls for food and territory. They also hunt and eat Spotted Owls. Occasionally, the two species mate, producing hybrid young called Sparred Owls. 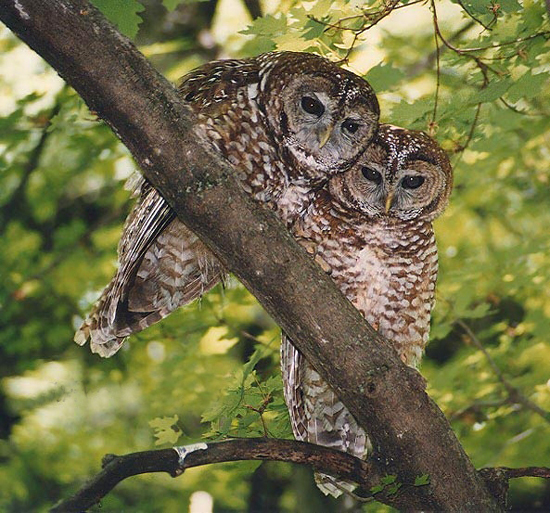 In 2008, wildlife officials quietly began controlling Barred Owl populations near confirmed Spotted Owl sightings. Seventy-three Barred Owls have since been captured and relocated. The province also authorized the shooting of 39 owls that refused to stay relocated. While this war in B.C.’s woods unfolded, we humans watched as new technologies transformed our own species’ struggles for social change and self-determination. While wildlife officers relocated Barred Owls, Facebook and Twitter enabled popular revolutions in Libya, Egypt and elsewhere. @Spotty Young couple looking for nest cavity or platform. Family-friendly + 200-year-old forest with flying squirrels only. NO Barred Owls! @WhoCooks4U @Spotty Have seen missing mate. Come to the cutblock by Chilliwack Lake tonight 11 p.m. for information. Bring friends. Owls and humans figure prominently in this affair, but other, overlooked creatures are also affected in the struggle to save Spotted Owls. We applaud your decision to finally intervene in the senseless massacre of flying squirrels, deer mice, hares and other small mammals by the invasive Barred Owl, Strix varia. While we celebrate your decision, we respectfully request that you broaden your intervention to include all owls in the area. These are the Great Horned, Northern Spotted, Northern Saw-whet, Western Screech, Short-eared, and Northern Pygmy owls. Thousands of our children die daily at the talons of these killers. None of us are safe. We live in terror. What unknown potential among these countless lost generations disappears every year down the murderers’ gullets, with only regurgitated fur and bones providing clues to victims’ identities? It is time for all mammals to unite in the furred cause: Freedom from fear of predation from above. Thank you, Don Enright, for checking the Twitter syntax and providing hashtags.